Cucumber beetles are a common garden pest that can wreak havoc on any small garden. They'll target cucumbers, squash and other garden plants. If these beetles are left to do as they please, by the end of the growing season they will no doubt reduce the annual harvest. Cucumber beetles will complete their life cycle there in the garden so to control local infestations, you need to treat the plants and the ground where their eggs and larvae reside. 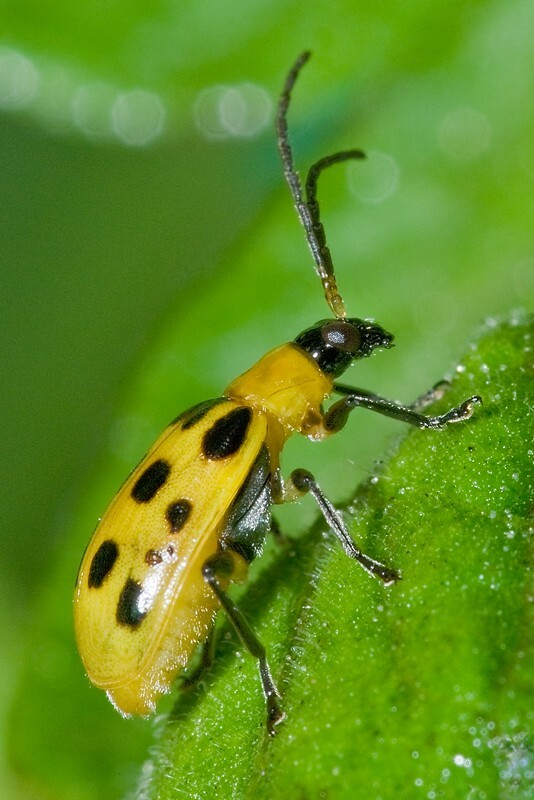 The adult spotted cucumber beetle is approximately the same size as the striped, however it has a yellowish body with 10-15 black spots on its wing covers. Here is a close up of the spotted cucumber beetle. 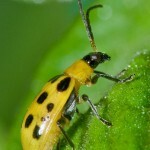 Cucumber beetles will appear in gardens once the weather warms. Adults don't die but overwinter so as soon as it starts to warm, they come out and can be seen. Adult cucumber beetles will need to feed so anything growing will be fed upon immediately. If you plan on starting a vegetable garden, it's a good idea to treat early cucumber beetle activity which in turn will minimize or even eliminate those that might forage on your crops later in the year. Though cucumber beetles prefer vine plants like cucumbers, squash and pumpkins, they'll eat what they can find early in the growing season. Feeding adults will chew holes through the leaves of new plant growth and they don't discriminate. Active adults will feed on most any garden variety plant they find and their damage can become substantial. More importantly, they are largely responsible for the spread of bacterial wilt. This fungus can be devastating to any garden so don't let cucumber beetle populations have free roam of your plants. Once they feed, males will seek females and mate. Female cucumber beetles will then lay eggs 8-25 days after mating. Females will deposit 225-800 in small egg clusters or singly into soil cracks at the base of cucurbit plants. Eggs hatch 5-8 days later and larvae emerge. These worm like grubs will spend the next 15 days feeding on roots and stems of fruit or anything else close by that is in contact with the soil. The pupal period is 6-7 days for them to molt. The time from egg to adult for the first generation of beetles requires about a month. Over the course of the summer, there could be 2-4 generations and most will take a month or longer to completely grow. 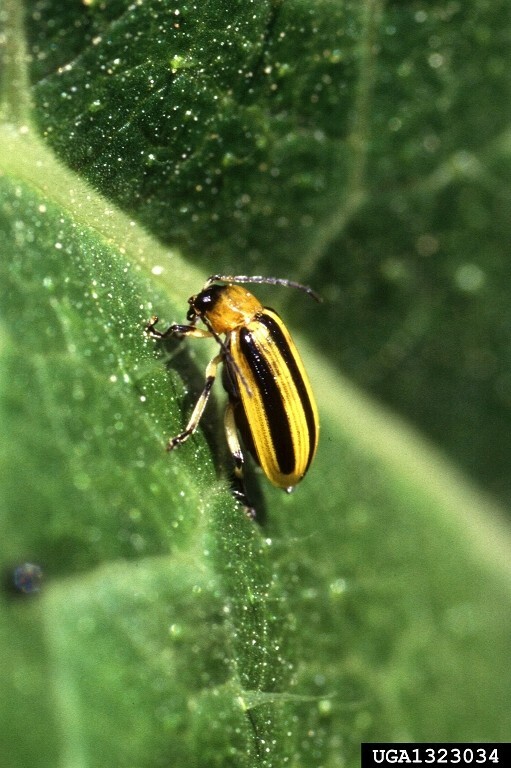 After cucurbit plants mature and fall weather approaches, beetles will migrate to wooded landscapes, bushy areas, barns, sheds and houses to find adequate locations to hibernate. Some may overwinter a mile from their original hatching site. Next spring these hibernating adults will emerge as the weather warms and seek new plant growth to feed. Since cucumber beetles overwinter (hibernate), they frequently find their way into the house. Homes which have gardens in close proximity to their siding will commonly have hibernating beetles move into wall voids and attic spaces. From there these beetles will find their way into living areas and become a pest. Though they don't bite or cause damage, they can be annoying. They'll commonly fly around lights and windows and activity will be high on any warm day. It's best to vacuum up active adults to help keep this activity minimal. Since cucumber beetle infestations can get quite severe, treatments inside the home is sometimes needed. 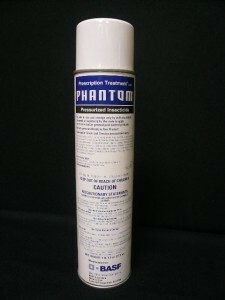 If you're seeing them inside the home, treat infested rooms with PHANTOM AEROSOL. This product is ideally formulated for use in the home since it's odorless and goes on “dry”. This means it wont' make a mess on baseboards, window sills and other areas where cucumber beetles like to nest and where you need to treat if you have them coming inside the home. Organic growers have long know about INSECTICIDAL SOAP to treat their gardens for cucumber beetles. 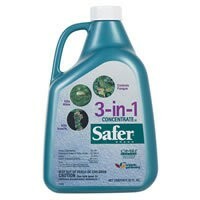 It has been one of the most common organic remedy sprays for cucumber beetles used over the years. Organic insect soap will work Ok on cucumber beetles but due to their tough outer skin, soap isn't your best option. Fortunately there has been an introduction of several more actives which seem to work better. 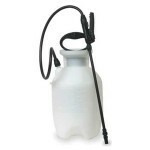 MULTI PURPOSE INSECT KILLER is one of these new products. It's like Soap but with an added synergist which helps to provide some much needed extra strength when dealing with insects like cucumber beetles. THREE in ONE CONCENTRATE in another product worth considering. It combines an insecticide, miticide and fungicide all in one spray so you're able to spray once and get protection from all the common problems organic gardeners experience. If you prefer to use something a little stronger than the organic cucumber beetle control products listed above, apply VEGETABLES PLUS with SPREADER STICKER. Vegetables Plus is highly active on cucumber beetles and should be applied with a good PUMP SPRAYER. The Spreader Sticker will help get the treatment to cover the leaves of the plant better. 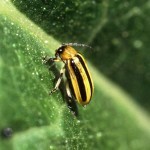 This is important since cucumber beetles like to hide out of sight and can avoid treated surfaces easily. Vegetables Plus is odorless (unlike Sevin or Malathion) and can be applied weekly if needed but treatments usually last 2-4 weeks. I think the Cucumber beetle is ruining my Zuccini plants.They are eating it right down to the plant skeleton. Is it the cucumber beetle?